Hi everyone! After a crazy summer filled with volunteer projects, international conventions and squeezing in a little beach time, I’m back in the studio and recording! This week’s show is my interview with author, podcaster, and all-around good guy / Disney Geek Jeff Heimbuch of the Communicore Weekly podcast. 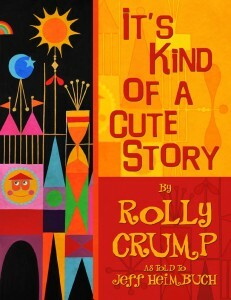 We’ll talk in detail about his book “It’s Kind of a Cute Story”, all about imagineer Rolly Crump. Rolly is a Disney legend who worked closely with Walt himself, and was instrumental in bringing life not only to WDW, but also the New York World’s Fair of 1964 – 65 and Disneyland itself before that. It’s a great time as we sail the wide oceans of Disney fandom, so come along for a fun time!